It is hard to believe, but another Centipede year is over. 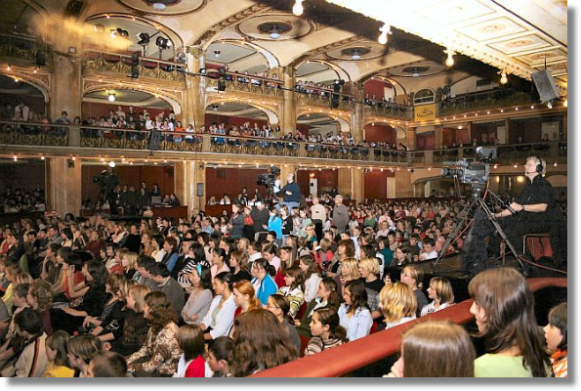 This year again, the Centipede schools met in the Lucerna Palace in Prague. The whole morning there were small groups of children near the Wenceslas Square who filled after the big Lucerna hall to the last place. Many honourable guest accepted the invitation to the Christmas Centipede concert – Countess Mathidla Nostic, the patron of the Union of the Blind, His Excellency Mr. Peter Nicolay Raeder, Ambassador of the Kingdom of Norway, with his wife, former vice-consul of the Norwegian Embassy in Prague Ms. Laila Kind Ronnholm, Deputy Chief of the Staff of the Army of the Czech Republic Gen.Maj. Proks with his wife and the representatives of the Order of St. Lazarus of Jerusalem. Everything began at 3 p.m. sharp. At first, Mr. Vomáèka (the director of the program) gave the last instructions – the concert was recorded for the Czech TV, as in previous years. With the children applauding strongly, Vojta Kotek entered the floor. He was followed by the children from the choir Mariella (15th elementary school in Plzen). Their songs were sung a couple of times during the evening. Vojta welcomed all the children and guests and invited Mrs. Bela. She thanked to all the children for the all-year help and work that could enable to send financial funds to the children in the children psychiatric hospital in Oparany and to Kohestan district, Afghanistan. The band MIG 21 sang three of its biggest hits. Jirka Machacek, the lead singer of MIG 21 sang a Christmas song with Mariella after. The children liked the performance of another young singer, Josef Vagner. Vojta Kotek invited Gen. Maj. Proks who told the children how important all their work for the children in the war-affected countries is and how all the notebooks, pens, toys, medicament, construction material and others come to the children there. The performance of the band „Hruza“ with its frontman Michal Hruza followed… and a huge applause followed after that. The concert was coming slowly to the end. The choir Mariella brought the real Christmas atmosphere with singing a couple of traditional Christmas songs. After that the children surrounded Mrs. Bela and she could not finish with handing out autographs for a long time. In the evening, the teachers and the Centipede friends met at a small celebration. They had many things to talk about, because they do not meet that often during the year. The representatives of the schools in Zubri and Praksice had a small surprise for Mrs. Bela – the children of these schools won with their works about the Centipede the competition „The Children’s achievement of the year“. See you next year at another Centipede Christmas concert !! !